In our last article “How to Avoid Back Pain: 4 Simple Practices”, Step #3 focused on Core flexibility and strength. The aspect of core strength cannot be over emphasized so we will continue exploring this topic with a deeper look into what exactly core strength is, what it provides, and how to achieve it. Most people will experience some form of low back pain in their lifetime. Many suffer an acute and debilitating episode which they feared would never fully resolve and would be plagued with a lifelong condition. By learning a series of exercises performed routinely, most back pain can be resolved and even prevented. An ounce of prevention goes a long way in alleviating and avoiding the perils of back pain. The mast of a sail boat is unable to support its own weight without reinforcement so it has ropes attached to prevent the mast from falling over and breaking. Similarly, the spine alone is only able to support about 35 pounds of pressure and the average person weighs much more, so it relies on specific muscle attachments for support. If these muscles become weak or imbalanced, they cannot effectively integrate the stress assimilated. That stress is then placed upon the static support structures such as the discs (intervertebral discs) resulting in subsequent damage and injury. By fine tuning the supportive musculature of the spine (core strength) the adverse side effects of repetitive stress on the spine and its supportive elements can be circumvented leading to greater physical function. This results in moving through our daily lives pain free and avoiding injury. Imagine that! So, what is exactly meant by our “core”? Most of us immediately think of the coveted “six pack” officially known as the rectus abdominus muscle. It is responsible for flexing the spine. This muscle is visible to the naked eye, but the architecture providing core strength is far more elaborate. The core group consist of more than a dozen muscles of the low back, abdomen, and hips. The abdominal muscles include the internal and external oblique muscles for rotational movements, and the deep transverse abdominis that compresses the abdomen like a girdle protecting not only the spine, but all of the vital organs that occupy the abdominal cavity. 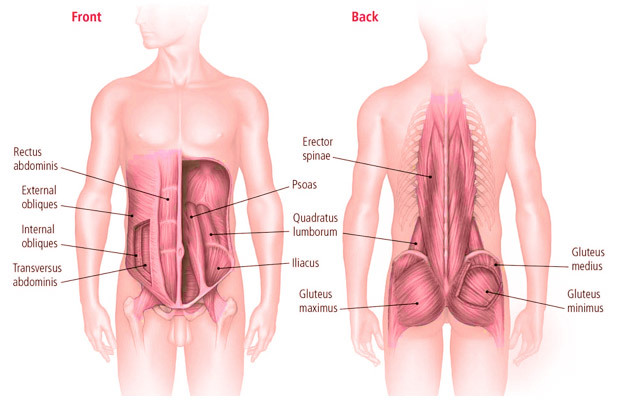 There are three additional important flexors of the spine: the iliopsoas muscle (iliacus and psoas muscles) and the quadratus lumborum, which work in coordination with the rectus abdominis in controlling the arch of the low back (lumbar spine) and at the same time flex and adduct the hip (moving the thigh towards the middle of the body). The iliopsoas muscle is most often referred to as the psoas (prounounced “soaz”). The psoas is the only core muscle which attaches directly to the spine. Without the proper maintenance of its flexibility and function imbalances can place tremendous stress on the spine generating pain and dysfunction. Since the core encompasses the vast majority of the torso there are also those muscles that reside on the posterior aspect or back. These muscles are referred to as the extensor group and include the erector spinae, gluteal muscles, and the multifidus. The extensor muscles are used to straighten the back (stand/extend) and abduct the hip (movement of thigh away from the body). THIS IMAGE will provide perspective as to the orientation of the core muscles to the skeleton and how they complement each other in providing structural, postural, and functional integrity. These muscles are considered the primary core group and are essential to a complete core strengthening program. Incidentally, the diaphragm is also a part of the primary group, though not a muscle that we target in a physical training program. It is also important to note the minor core players, which are the latissimus dorsi and trapezius muscles. Follow THIS IMAGE to learn the minor core muscles. As you can see, the intricate detail and engineering of the core muscle group provides the evidence and rationale for the focus and effective conditioning of these muscles. It is important to know that your core is not just the abdominal muscles. Working all of these muscles will build a strong foundation improving overall strength, posture, durability, and making everyday tasks such as sitting at your desk working on a grant proposal or bending over to pick up a box or your little one much easier. Doing core strengthening exercises does not have to be a lifestyle changer, but a routine that is integrated into your lifestyle and performed consistently, just like brushing your teeth and eating a nutritious breakfast. To help you get started with this activity of daily living or to enhance the core strengthening program you may already have in place, here are suggested plans for the beginner, experienced, and those women who are pregnant. These core programs are meant to be combined with your flexibility routine and regular chiropractic care. Remember, build up gradually and do not take on a new fitness activity if you have not been given approval for exercise by your physician, especially for those women who are pregnant. Note the name of the exercise contains a link to an image. Breathing smoothly and rhythmically, hold the position for 15 seconds for 4 repetitions. Build up goal is to a continuous minute. Begin on all fours, hand under shoulders and knee under hips. Extend the left arm straight out in front of shoulder and right leg directly behind and hold for 2 full breaths. Head remains in neutral position with eyes focused at floor. Return to starting position and repeat to opposite side. Breathe smoothly and rhythmically, performing 1x10 repetitions on each side. Build goal to 3x10 repetitions on both sides. Lay on side with forearm for support while setting it perpendicular to your torso. Legs on top of each other with knees bent and feet pointing behind you. Lift up onto forearm and remain aligned from head to toe, as if trying to fit between two panes of glass. Breathing smoothly and rhythmically, hold the position for 15 seconds for 4 repetitions and then repeat on opposite side. Build up goal is to a continuous minute. Assume straight arm plank position. Lift leg and bring knee towards the outside of elbow of same side. Repeat movement with opposite leg. Breathing smoothly and rhythmically, perform 1x10 repetitions on each leg. Build up goal is 3x10. 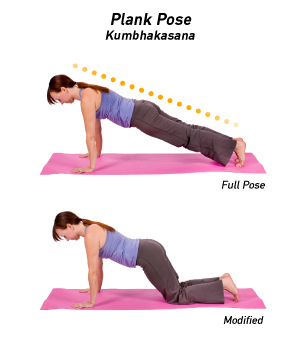 In cases of hand or wrist issues, perform exercise from modified plank position. Lying on back with knees bent and feet flat. Draw belly button in towards the spine. Contract buttocks and lift hips until your body forms a straight line. Inhale and exhale smoothly and rhythmically holding position for 15 seconds and repeat 4 times. Build up goal to a continuous minute. Assume standard push-up position (hands directly under shoulders, arms extended, legs straight and up on toes/balls of feet, spine inline from top of skull to tailbone). 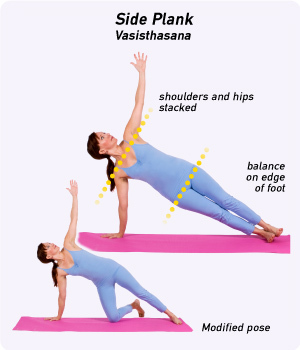 Lift one hand and reach across body to opposite shoulder and then return hand to floor. Repeat same action with opposite hand. Breathe smoothly and rhythmically, 1x10 repetitions building to 3x10. Sit on floor with legs straight out in front of hips. Lean back slightly and lift legs off ground. Bend knees and lift arms out to sides about chest high. Simultaneously bring knees to chest and arms forward bringing hands together over knees. Reverse this movement separating arms and extending knees to starting position. Sit on floor with legs straight out in front of hips with knees slightly bent. Lean back slightly with arms extended in front of shoulders. Rotate to one side, then rotate to other side = 1 repetition (modification: hold weight plate or medicine ball adjust weight based on level of strength). On floor on all fours, hands placed directly underneath shoulders with hips in line with knees. Lift right hand and extend arm straight out in front of shoulder. Simultaneously lift left leg extending it straight back. Body is in a straight line from fingertips of right hand to toes of left foot. Bring left leg in and under stomach to touch right elbow. Extend leg and arm out returning to starting position and repeat. Perform on opposite side at prescribed number of repetitions. Lie on floor with knees bent and your arms at your sides. Lift hips toward ceiling like being pulled from belly button. Keep rib cage low and squeeze backs of thighs and buttocks. Lift a foot slightly off floor and extend leg (hold for 3 seconds). Sart in a standing position with your feet hip-width apart. Dtaw your bellybutton into your spine, tuck your pelvis slightly and bring your fingertips to your ears. Inhale tucking your chin and exhale crunch forward and squeeze as if you were going to bring shoulders to hip bones (as you would do if lying on back). 10 reps x 1 set, building to 3 sets. On the floor lie on side with your forearm for support while setting it perpendicular to your torso. Lift yourself onto your forearm and remain aligned from head to toe, as though you're trying to fit between two panes of glass. Inhale and exhale rhythmically while alternating work and recovery phases. 10 cycles (cycle = right and left) x 1 set, building to 3 sets. Lie on back with knees bent and feet flat.